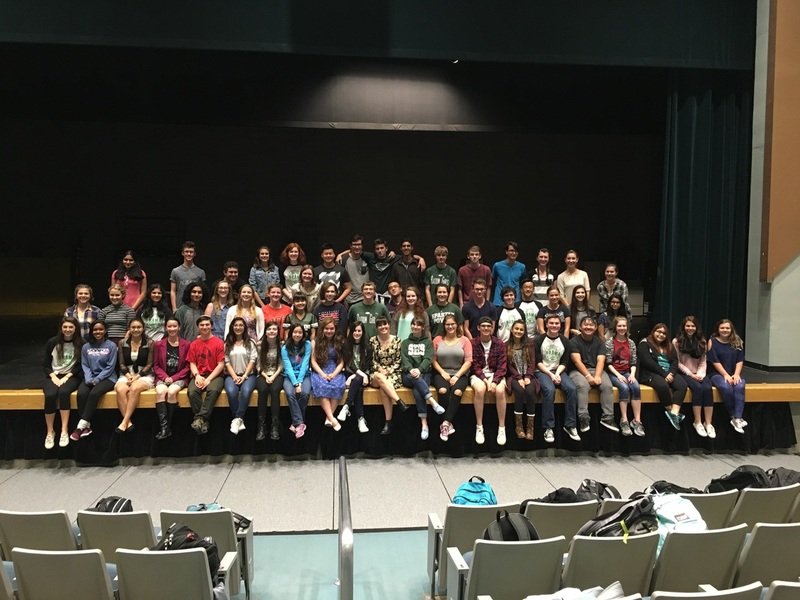 Skyline High School's Theatre Program encompasses classes (Theatre Arts & IB Theatre), three extra-curricular productions each year, the Drama Club, Thespian Troupe (Honors Society), and Improvisation Troupe. Comprehensive - Students are encouraged to participate both on and off the stage. Crew and actors are seen in the same manner and on the same level; after all, it takes both to put on a great show! In class, we learn all aspects of theatre, from history to production, from acting to design, from business to direction. During extra-curricular activities, we develop thorough hands-on skills and practical knowledge to produce complete and successful performances. Fair - seniority has nothing to do with casting. Each show is cast based on auditions and professionalism. You can be a freshmen and earn a lead just as much as you can be a senior and be in the ensemble. Students embrace this professional environment and develop perseverance in "earning" roles and positions, instead of being given things through entitlement. ​Professional - Students are taught to regard theatre as an intellectual and creative art form. Practical experience leads to a full appreciation of this discipline and teaches a solid work ethic, grit, technical skills, and social skills. I hold students to high standards and students meet these expectations by embracing this atmosphere. Inclusive - if you are nervous about signing up to participate in a show, just jump in! I guarantee you will not regret it and you will find that our program will become your second home. Often, the only thing that keeps students from participating is their own hesitancy. As members of an artistic community, we embrace diversity and appreciate all the variances in personality and opinions. Volunteer Based - Everything from our set to our costumes is created “in house” meaning that it really takes the dedication of students and parents alike to create our wonderful productions! We are a community of theatre practitioners and "it takes a village!" Balanced - Each season (considering past seasons) Mrs. Fry chooses shows that lead to balance and experience in all genres. This gives many different students access to different kinds of art and opportunities. I also encourage students to focus on achieving academic excellence as well as theatrical excellence while maintaining self-care and health. - Students involved in drama performance coursework or experience outscored non-arts students on the 2005 SAT by an average of 65 points in the verbal component and 34 points in the math component. - Drama activities improve reading comprehension, and both verbal and non-verbal communication skills. - Drama helps to improve school attendance and reduce high school dropout rates. - A 2005 Harris Poll revealed that 93% of the public believes that arts, including theatre, are vital to a well-rounded education.